This photograph is a representative image of the microscope with a 6x6 transmitted light stage. 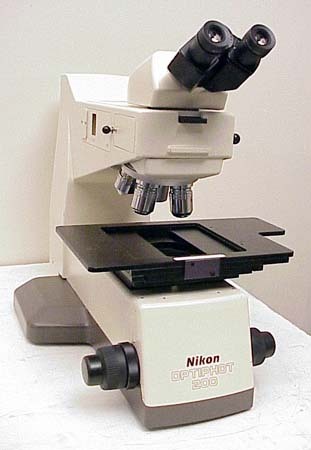 In addition to this Nikon Optiphot 200, Capovani Brothers Inc stocks a wide range of used upright microscopes. Typical manufacturers include American Optical, Bausch & Lomb, Leica, Nikon, Olympus, Wild, and Zeiss. To view our complete stock of used upright microscopes visit our Upright Microscope category. This used reflected light microscope and all the other used and refurbished semiconductor, scientific, and laboratory equipment listed on this website are owned by Capovani Brothers Inc. and stored at our facility in Scotia, NY. 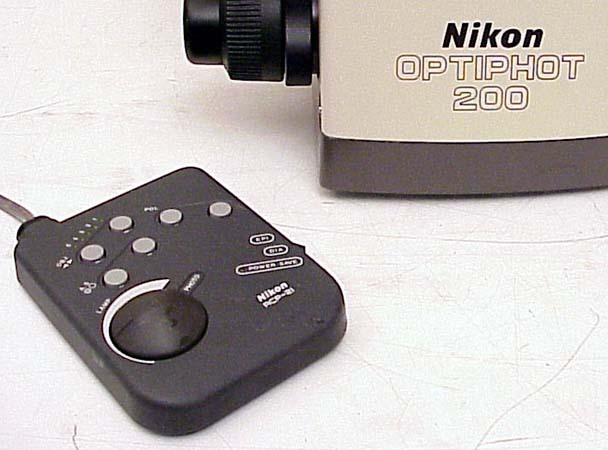 Accessories There is a remote control included with each Optiphot, model number RCP-21. Other Information There are four objectives included with this microscope, specifications above. The nose peice can hold five objectives.